Tired of the dark brown hair dye and look for something different? 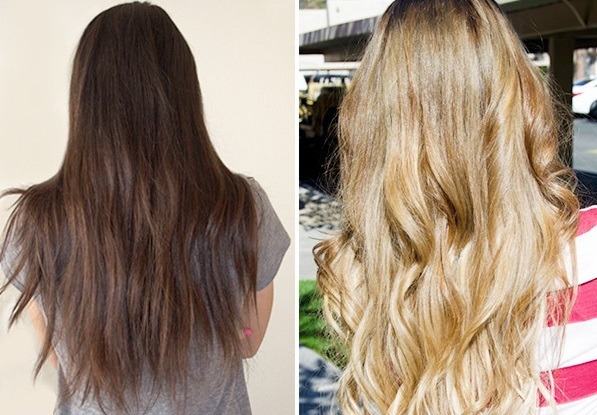 Learn some fast tips to strip some of that color from your tresses and make it look lighter. It's every woman's nightmare. You go into a salon with the intention of turning your hair a darker color but when the towel comes off, you are appalled: It is much darker than you imagined! Lightening dark brown hair dye is something that women have been trying to do ever since the dawn of hair color. Sometimes the tricks work and sometimes they don't – you might have to try several different options until you figure out what works for lightening your hair type. So the worst has happened: you have darker hair than you expected. What can you do about this? Fortunately, there are several options that might work. Immediately use a clarifying shampoo on your hair. Do this as soon as you possibly can, before the color really has a chance to set as deeply as it can. The clarifying shampoo might strip some of the color from the hair. Be sure to condition very well afterward to keep from drying out your tresses. If you have done the color at home, immediately call the hotline number on the box. Those at the hotline deal with questions like this all the time, and they might have many tricks to share with you on how to make things look lighter. You can try lightening dark brown hair dye with professional lighteners, but then you will need to use toner to correct the resulting color. Rather than go through all that chemistry hassle, it might be best to go to a salon and ask for their assistance. If you are at the salon when it happens – when the towel comes off and you see dark hair that makes you cringe, ask the stylists immediately if she can fix it. If you need to lighten the dark hair but you are tired of all the chemicals, you can turn to home remedies to help. Most of these work like a charm, but it might take time to find the one that works for you. Chamomile tea. Soak your hair in brewed chamomile tea that has been cooled. Put it into your hair, getting it as saturated as possible. Wear a tight-fitting shower cap to help keep the liquid in and avoid drips. Do this for thirty minutes, then rinse. You can also try adding a bit of lime and mint to the tea, but be sure to strain it before you use it. Lime. Squeeze mature limes into a bowl and mix with water. Put this into a spray bottle and use it to spray your hair until thoroughly wet. Let it remain there for half an hour, and try to be outside while you do it – the chemicals seem to work better when you are outdoors. Rinse it out when you are through. If lime isn't available, tomato puree will work – but it won't smell nearly as good! Baby oil. Apply a little bit of baby oil to your hair, just enough to get it damp. Then go out in the sun! Stay out as long as you like, but be sure to rinse your hair thoroughly when you come inside. Then use a strong shampoo that will strip the rest of the oil out of your hair. Hydrogen peroxide. This is a very strong chemical when it comes to your hair, so make sure you use it carefully. Put the peroxide into a spray bottle and spray it very evenly over your hair. You might have to use clips to hold some sections of hair out of the way while you spray others to ensure a nice, even covering. Leave it in your hair for thirty minutes, then wash it away with cold water. Sometimes you don't want to lighten your hair too much; you just want some pretty highlights. In that case, adding highlights to your dark hair can be easy. Start by buying a kit that is designed for your particular hair color. Look on the back of the packaging to make sure, and compare your current hair color to what you see on there. Do the streak test when you open the kit. That means you test one section of hair, and time it to make sure you have the right color. Although this might be tedious, it pays to do it, because you can avoid messy problems with color that turns out very different from what you want. Don't use the cap or streaking items that come in the kit. Instead, use a toothbrush to apply the color and see more natural results. You can also use paintbrushes in varying sizes. Paint onto one-inch sections of hair at the front, near the face. Paint half-inch sections further back, near the top of your head. Lift the hair and apply quarter-inch sections underneath for a peek-a-boo effect. Make sure that your highlights are on all parts of your hair, and don't try to keep them symmetrical or the same length; the best highlights are the ones that appear to be natural. Use the dye for as long as directed, shampoo it out, and then use a deep conditioner to add back the moisture that dyeing often removes from your hair. Finally, use a toner. These toners can leave your hair looking glossy and shiny, and can soften highlights so that they look very natural.